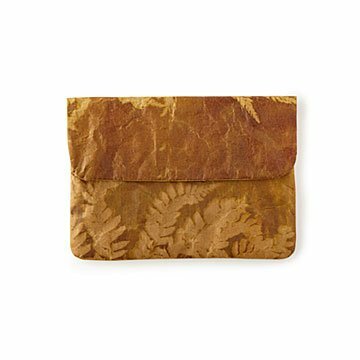 Wendren Setzer turns cement bags into unique tablet sleeves with prints based on antique botanical photos. Driving in Cape Town one day, Wendren Setzer found herself gazing at a truck next to her, full of dry cement bags. The designs printed on the paper looked cool, she thought—so cool that she decided to try making accessories out of the paper. After a lot of experimentation, she succeeded—brilliantly. She and her all-female crew fuse it to cotton fabric, stitch it, give it a water-resistant coating, and voila: an elegantly protective tablet sleeve. Wendren collaborated with Amanda du Plessis, a well-known Johannesburg designer, on the stunning pattern. Based on Thomas C. Blagrave's mid-1800s photographs of South African ferns, it evokes nostalgia and dreams. Beautiful, useful, original, sustainable, ethically made—there's not a single one of our favorite boxes that Wendren's sleeves don't check. Handmade in Cape Town, South Africa.